During the re/code Code Conference earlier this week in California, GoPro’s CEO Nick Woodman detailed a rig the company is working on that will accommodate six Hero4 cameras to record multi-angle footage for virtual reality uses. Google revealed a similar rig at its I/O 2015 conference yesterday, with the primary exception being that it holds 16 GoPro action cameras rather than six. The rig is called Array, and it was made in partnership with GoPro for Google's new Jump virtual reality platform. 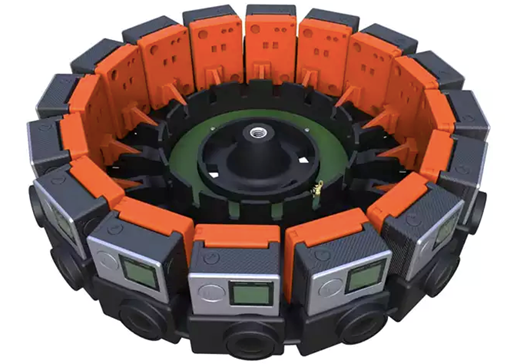 Array is a circular device able to hold sixteen GoPro action cameras that each record footage at different angles. The resulting footage will ultimately be stitched together to produce 3D videos for YouTube, which will be viewable using 'Cardboard', an inexpensive VR headset first introduced by Google at its I/O 2014 event. According to Google’s Vice President of Product Clay Bavor, the Internet giant has shipped more than a million Cardboard units since the product’s introduction. Do they stream two streams at a given time stamp relative to my head position? Morphing them for subtle head position changes to make it seamless? You build a VR headset literally from cardboard, place your mobile into it. Two added lenses lets you focus to your mobile from 5 cm distance. The app uses the movement sensors in your phone to send movement data to youtube which in turn will send you the updated video stream corresponding to your new viewing angle. Wait until the adult video industry gets a hold of this. There's a lot of fluffing going on for the next scene. While that may produce high quality 360 degree coverage, this array concept is also designed to provide 3D (eg. stereoscopic) data for the full 360. To do such for a small angle of view, two sensors will do, but as you increase the angle of deviation from the vector normal, the effective angle of disparity between two sensors will gradually fall to zero at 90 degrees, significantly reducing the quality of the stereo. I think the Gopro gives at least 120 degrees of horizontal, so if they just wanted 360 coverage, an array of 3 would work. OK, so in theory, 2 Ricoh thetas an a stick should do. That would cover 360 spherical. The pictured setup does not, it's just 360 panorama. When a Ricoh Theta spherical image is cropped to a "normal" point of view, the resulting resolution will leave lots to be desired. @mile green... 2 ricoh theta would be insufficient for 360 3D VR, because the input devices have to ALWAYS be a few inches apart regardless of the direction you are looking in (to simulate the parallax that you get with two human eyes). So you can see that you would need several more pairs of cameras... at least 4, probably 8... but I guess Google thought 16 gave you the best image quality. 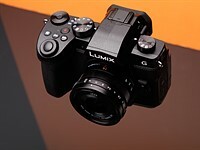 16 cameras with microscopic sensor each worth $400 bucks. No thanks! The benefit of this rig is not so much pure image quality... but the immersive feel of it while viewed in a VR rig like Google Cardboard (which costs $25) or say the Oculus Rift. Are you seriously suggesting that a single Kodak SP360 will have the same or better IQ than an array of 16 GoPros? @Mister Roboto... If you are that picky about image quality there is another setup that they have... 4 EPIC RED dragon 6K cameras with full-frame sensor (well technically 34.5mmx16mm) with 8* fish. @acidic I think Mister Roboto has just discovered non-tiny sensors (he apparently used to own a Fujifilm FinePix HS50 EXR with a 6.4 x 4.8 mm sensor as of a year or two ago) and is excited to be part of the party now, maybe a little overly so. While I own a full-framer sensor and understand that sensor size does make a difference... I have also looked a the 4K video, low compression, video recorded coming out of a GoPro Hero4 using Protune... color-corrected, and in most cases it is as good as anything but the top-end video gear (Panasonic GH4 or Sony A7S, etc...). "Are you seriously suggesting that a single Kodak SP360 will have the same or better IQ than an array of 16 GoPros?" Let's say the same, it does the same job at the cost of less than 1/10th of the price. Show me a jaw-dropping video from GoGo camera that will justify its bloated price of $400. "@Mister Roboto... If you are that picky about image quality there is another setup that they have... 4 EPIC RED dragon 6K cameras with full-frame sensor (well technically 34.5mmx16mm) with 8* fish." No need for FF sensor, 1 inch will bury GoGo cameras in IQ 10 folds. But for fun video like this, Kodak SP360 or Ricoh Theta will do just fine. 1080p video still rocks when viewed on 40 inch monitor. @Mister Roboto. Two things... first the Google Jump rig is not only 360, but it is 360 stereoscopic. I admit that 3D isn't the end-all-be-all, but it noticeable when you view the footage in a viewer like an Oculus Rift (or the $20 Google Cardboard). Because the footage is calibrated for a single pair of eyes, the effect is more noticeably than on big screen movies. The second is, that you seem to overly poo-poo the small sensor GoPro. I agree that larger sensor is better... that benefit largely only comes into play in dimmer lighting situations. Furthremore, a GoPro sensor is a little less than half the size of a 1" sensor. With the overlapping fields of view... the actual surface area used to create output image of the Google Jump is MORE than a 1" sensor - combined with the fact that the three sensor often exposed at difference shutter speeds balanced and merged in post-processing... you actually probably end up with better over dynamic range. You do realize that the results from the GoPro array will allow you to see crops of the entire fov at high resolutions. Crop the Kodak footage into normal perspective and you will have low resolution garbage. Ok so what is the output of this array rig? 16x2MP-ish cam? I would prefer 4x4 or 8x2 stacking to produce high resolution image than 16 horizontally which will produce mediocre vertical resolution and decent horizontal resolution. The out of the array is the equivalent of five 4K outputs (GoPro Hero4+ can take video at 4K/30fps). If you looked more closely at the original photo of the rig in the article, you would have noticed that all the GoPros are on their side to maximum vertical resolution at 3840. Let's say they use 3 cameras to form an image (looks about right). Thats 6480 horizontal resolution total. Assume that the avoid the other 1/3 of the left and right cameras. That leaves you with a resolution of 4320x3840, from which they crop down to make the viewport (do you have any background in Computer Graphics?). Here is a link to Google's talk about it I've queue it up to part where he talks about how they process the assembled/composited video, but then crop it to a standard HD video viewport. Why not 16 Google Nexus 6 phones instead of 16 GoPros? I just got back from Google I/O. I did ask them why GoPro versus a more generic cheaper/less wideangle camera. Part of the reason, they used GoPro was simply to get more "street cred" with the photography/video community. However, the Nexus 6 would not be a good choice anyways. A Nexus 6 costs $649, a GoPro Hero 4 is $400 now. As you must know megapixel count is not very important compared to the the other features of a camera (an 8% increase in resolution is trivial compared to being able to record in a relatively flat format like Protune that allows for a lot of post-processing). Finally, the GoPro Hero has a much wider angle view... allowing for more overlap scenes, this allows them to have more depth perception as well as helping the seam-stitching and exposure/color balancing. It amuses me that you are trying to give HW related advise to Google. If you really want to help I have an advise to you: Just go on Google website search for positions in this field. Send in your resume and who knows... They may contact you. They are hiring like crazy. I had forgotten that Nexus 6 has neither removable storage nor removable battery. So those architectural decisions may have been deal-breakers for this configuration too. Every wedding videographer needs one. Haha. Don't knock it. When rigs similar to this hits retail at reasonable prices say 5 years from now, let's just say Samsung or CaNikon makes one with 6 apsc sensors, watch every wedding photog go out and grab one. No need to hire a videographer when the bride and groom can each wear one of these at the ceremony. I like where this is going. Perfect for oculus!!! Bravo....we'll get to experience places like we've never been. How about looking up and down since it is meant for VR recording? The cameras are in vertical orientation, which gives you 180 degrees to move. The will be some stitching issues at the "poles" of that "bubble" but it surely will boost nice resolution. would be good if they included a SAMPLE clip of what that can do. "....According to Google’s Vice President of Product Clay Bavor, the Internet giant has shipped more than a million Cardboard units since the product’s introduction..."
I cannot see it in the pic, but they should REALLY have included an USB hub into that rig with docking ports for each camera. Central readout and charging would make it much more sensible. and it will cost (raises pinky to mouth)...ONE MILLION DOLLARS! They would be first then.. It's a fact. 16 * 400E = about 6400E plus the cost of the rig? Don't assume that Google paid retail prices on those cameras. I am fairly certain they were provided free to Google for the cross promotional possibilities. I'm thinking about the appeal to a single videographer/studio (who maybe already has some GoPros BTW).